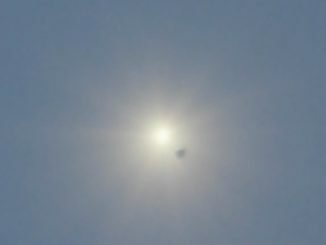 Blue Origin scrubbed the planned launch Tuesday of the company’s suborbital New Shepard booster from West Texas due to a “ground infrastructure issue,” and later said the flight would be pushed back to early 2019. 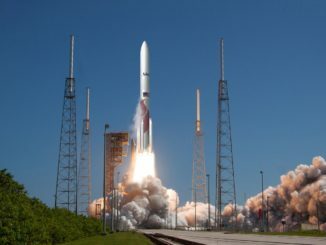 Ending months of speculation, Blue Origin, a company owned by Amazon-founder Jeff Bezos, has won a milestone contract to provide first-stage rocket engines for a powerful new booster being designed by United Launch Alliance to replace its current fleet of Atlas and Delta launchers, the companies announced Thursday. 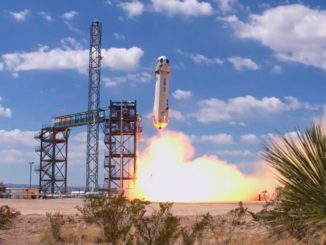 Blue Origin’s suborbital New Shepard booster launched Wednesday on an uncrewed test flight, sending a capsule on a brief jaunt into space over West Texas to demonstrate a key safety feature for space tourists and scientists riding on the company’s future rockets. 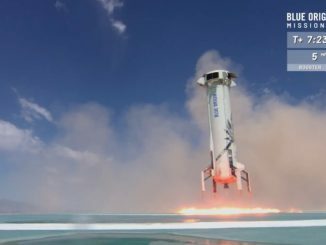 Blue Origin’s New Shepard booster, topped with a capsule carrying a dummy dubbed Mannequin Skywalker, took off Sunday from the company’s sprawling test site in West Texas on a 10-minute trip to the edge of space and back. 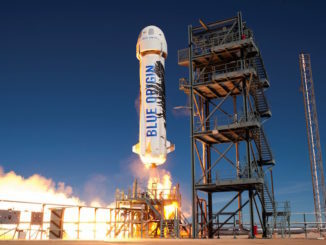 The privately-developed New Shepard booster, designed and built by Amazon billionaire Jeff Bezos’s space company Blue Origin, took off from a launch pad in West Texas, briefly flew into space with an instrumented capsule, and returned to a rocket-assisted landing Sunday in another test before humans climb aboard the suborbital spaceship. 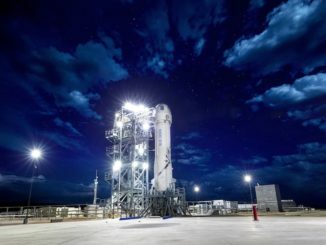 Blue Origin plans its next suborbital test launch Sunday from the company’s sprawling development complex in West Texas, the company’s owner Jeff Bezos announced Friday. 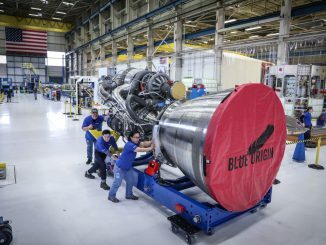 A full-scale BE-4 engine developed by Blue Origin, the space company founded by Amazon.com’s Jeff Bezos, is installed on a test stand in West Texas for a series of hotfire tests that United Launch Alliance will closely examine before settling on the reusable methane-fueled engine for its new-generation Vulcan rocket. 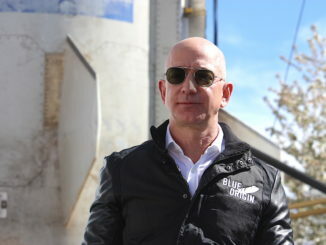 Amazon.com’s Jeff Bezos, now the second-richest person in the world, is funding his space company’s lofty ambitions $1 billion per year, driving Blue Origin closer to taking paying passengers to the edge of space and fielding a reusable satellite launcher that will usher in a golden age of space exploration, the billionaire tycoon said Wednesday. 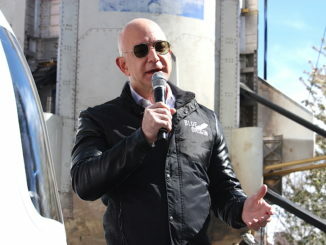 Billionaire Jeff Bezos, founder of Amazon and the surging space company Blue Origin, spoke with reporters at the 33rd Space Symposium in Colorado Springs, Colorado. 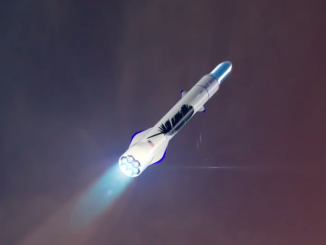 Amazon.com’s Jeff Bezos revealed new details of his space company’s reusable orbital-class booster Tuesday, releasing an animation illustrating the rocket’s liftoff from Cape Canaveral and announcing a contract with Eutelsat to put a commercial communications satellite on one of the launcher’s first missions.